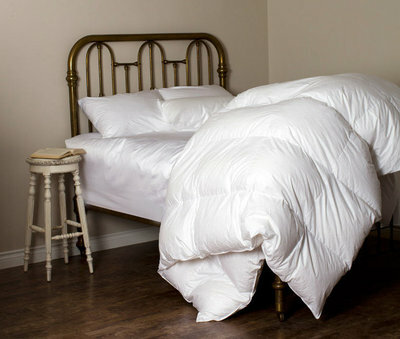 St Geneve's Laroche down comforters are filled with Canadian processed white duck down certified under the Zurguard® system so that the down is hypoallergenic, and will stay lofty and warm for years. This down is a good quality that lofts at 575 cubic inches per ounce. The white ducks are raised to be more mature and larger, so the down is also larger, puffier, and more resilient, which makes this duck down superior to many grades of goose down typically available in department stores. These items are made to order and usually ships in 4-6 weeks. St. Geneve's Laroche is also Available in Dual Zone to allow for differing warmth requirements. Contact us for details on this option. The Laroche duvet is covered in a soft 380 thread count cotton sateen ticking with beautiful finishing details, for a luxurious look and feel. It has been designed to be a wonderfully comfortable duvet, with all the same fine finishing details of all St.Geneve duvets.